I don’t know about you but I love finding out about the stories behind people’s Instagram Top 9; I kinda feel like they’re nice, heartwarming, fuzzy, reads. So, I bring you the stories behind my Instagram top 9. It’s also interesting to note that not one of these photos was posted to my account (@rosie_baillie if you’re not already following) in the past three months, showing how damn stupid the latest algorithm updates are. From first glance, we can definitely see my top 9 are all about blues, greens, water, and mountains. Oh, and Canada, duh. Because do I talk about anything else? No. At least it’s nice that I know I’m a broken record. The first photo was taken when I saw the northern lights (obviously) in Iceland with my Mum. It was a dream come true, ticking it off the bucketlist, moment, and I seriously recommend it. If you want to know more, I did write a blog post about seeing the northern lights and the company I went with. This next photo is actually at least two years old, maybe three now. It was taken the first time I visited Edinburgh, and had a trip out to Loch Awe. Early last year, my sister planned a trip to Scotland and started asking me questions about it, so I started fangirling to her and just had to repost this. The third photo is one of my favourite photos of all time; Daz and I at Moraine Lake, our happy place. I love it because it shows off how darn stunning Moraine Lake is, how grand the peaks are, the shade of blue of the lake, the reflection, and it makes me feel something. We’ve got a print of it in our living room, which I can see right now, and every time I look at it I feel fuzzy inside and have to fight off the urge to head over to SkyScanner and book a flight for tomorrow. 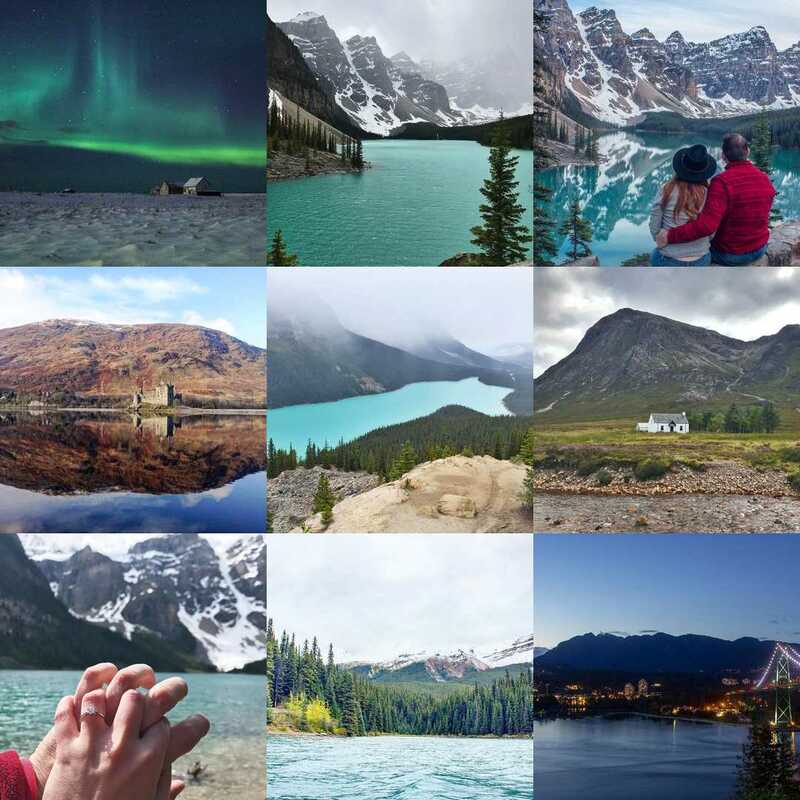 As I said in the caption, it just isn’t possible to have too many photos of Moraine Lake in an Instagram feed. Moraine Lake is a funny ol’ place because the weather is very changeable. On the same day this photo was taken, we also had blazing sunshine and snow (at the same time). Every time I see a photo of Peyto Lake looking beautifully clear and sunny I wonder if those people visited a Peyto Lake in a parallel universe, because this is what I saw. And it’s what happened each of the four times Daz and I tried to visit the lake. Nevertheless, it’s still beautiful, and moodier than me circa 2007. This is a quaint looking hostel just off the main road through Glen Coe in Scotland. It was one of the first outings Daz and I had since moving up here. I’ve loved Glen Coe since the moment I first set my eyes on it and it was SO nice to be able to show Daz it. This is another solid fave of mine from 2017, and it also features Moraine Lake in the background, so it has all the qualities of the best photo ever. I don’t even know what to say about this photo other than it was a perfect day, one of my favourite moments of my life, and there better be a photo appearing in a future ‘Instagram top 9’ of our wedding at the edge of that lake. I’m actually surprised this photo appeared in my top 9 because I really feel like I’ve taken photos that are a lot better. But, it was posted at the start of 2017, again, the algorithm. This was taken back in September 2016 when we attempted to kayak on a very windy Maligne Lake. I do not recommend it to kayaking noobs, and you can read more about that horror story here. I’m so happy that Vancouver made an appearance in my top 9, because that beautiful city worked hard to make us fall in love with it. And we really did. This was taken at the edge of Stanley Park and is a shot looking across the Lionsgate Bridge towards North Vancouver with the mountains in the background. I think it’s a pretty great summary of why we fell in love with Vancouver; all of those things in one view, perfect. And, to make it even better we saw our first raccoon a few minutes before we took this photo. Now, that might seem like a bizarre thing to get excited over but we don’t have racoons in the UK! They look so adorable and remind us of the kids cartoon, The Raccoons. If you shared the stories behind your Instagram top 9, link me because I wanna see them!